Serenity Funeral Directors in Eastbourne offers uniquely personal funerals to the families in our local community. If you have experienced loss, we can arrange a loving and dignified send off. Here to provide support at a difficult time, the team at our Eastbourne funeral directors will be able to offer you comfort and advice when you most need it. We will help to ease your concerns and answer your questions as we find out how you would like the funeral to proceed. However you choose to remember your loved one, we will tailor the details according to your wishes. This will be the case regardless of whether you choose a religious or a humanist funeral, a traditional service or something more contemporary. 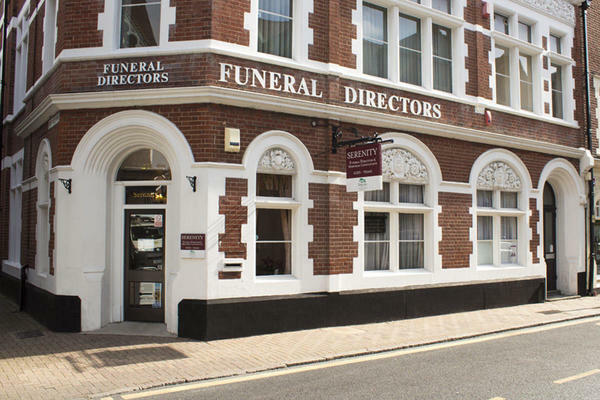 Our funeral home is a charming building situated on Eastbourne’s South Street. With its welcoming reception area, private arrangement room and two chapels of rest, all appointed to help you feel more at ease when you visit, you can rest assured you will be well looked after while in our care. We are accessible to all parts of the town, including Lagney, Meads and Willingdon, along with our neighbouring communities on this part of the East Sussex coast. If, for any reason, you are unable to get here, we can visit you at your home, or somewhere equally convenient. The team at our funeral directors is here for you at a time of need. There is somebody waiting to listen and provide guidance both day and night. Call us any time and arrange the funeral of your loved one. Call us today on 01323 736446 to talk through your personal requirements. At Serenity Funeral Directors, we understand how special life is with those that you love. For us, every funeral is unique and personal. We have a service to fulfil every wish, with every detail carried out with the same uncompromising quality of care. From a traditional service, to a colourful woodland burial, your options are limitless with our Full Service Funeral. If you have a little more flexibility when it comes to arrangements, then we can provide a Simple Funeral for a lower cost. There is paid parking on our street for up to two hours. Please call if you need advice on where to park. We are a few doors down from the Dew Drop Inn on South Street, at the corner of Calverley Walk. Our staff are available 24 hours a day on 01323 736446 if you require our services outside of these hours.